MSCA-COFUND programmes are European Commission initiatives that offer additional funding for new or existing regional, national and international programmes to provide an international and intersectoral dimension to research training and career development. Doctoral programmes as well as fellowship programmes for experienced researchers can be supported. Therefore these actions are meant for organisations that fund or manage doctoral programmes or fellowship programmes for researchers. Each COFUND proposal should have a sole participant, which could be a government ministry, regional authority, funding agency, university, research organisation, research academy or enterprise. Once the COFUND proposal is selected to be funded, the applying organisation will open up a call to select researchers to enroll its doctoral or fellowships programmes. Future calls How to apply? who can apply? What is funded? Both, in 2016 and 2017, Spain has been 1st country with the highest return in MSCA COFUND calls. In 2019, there are 32 COFUND ongoing programmes in Spain: 9 FP7 and 23 H2020. This does not mean that all of them have foreseen open calls; in fact many of them have ongoing contracts for the researchers but will not launch new calls. There are 11 of these programmes which still have remaining calls to be launched aiming at recruiting 58 early stage researchers and 330 experienced researchers. In the following map you will find information about these future calls. Click on the map to find your new career opportunity!! For further details about these programmes check our publication Ongoing_MSCA_COFUND_CALLS_SPAIN_2018 (629.79 KB) . How to apply to COFUND-PROGRAMME positions? Support cannot be awarded to researchers who are already permanently employed by the organisation hosting them. For COFUND Doctoral Programmes (DP) researchers must be early-stage researchers (ESR), i.e. at the date of recruitment or the deadline of the co-funded programme's call, be in the first four years (fulltime equivalent research experience) of their research careers and have not been awarded a doctoral degree. For COFUND Fellowship Programmes (FP) researchers must be experienced researchers (ER), i.e. at the date of recruitment or the deadline of the co-funded programme's call, be in possession of a doctoral degree or have at least four years of full-time equivalent research experience. Mobility rule: Researchers supported under this scheme shall comply with the mobility rules of the Marie Skłodowska-Curie actions: researchers may not have resided or carried out their main activity (work, studies, etc.) in the country of their host organisation for more than 12 months in the 3 years immediately before the call deadline, or recruitment date (COFUND). The organisation must recruit each eligible researcher under an employment contract or 'equivalent direct contract' with full social security coverage (including sickness, parental, unemployment and invalidity benefits, pension rights, benefits in respect of accidents at work and occupational diseases) except where national legislation prohibits this possibility. When an employment contract cannot be provided, the organisation must recruit the researcher under a 'fixed-amount fellowship'. In this case, the living allowance will be halved and the beneficiary must ensure that the researcher enjoys minimum social security coverage. Remuneration: The EU contribution must be used exclusively as contribution to the management of the programme and to the living allowance of the researchers, which is solely for the benefit of the researchers appointed under the programme and includes all compulsory deductions under national legislation. A top-up (funded through other resources including EU programmes other than Horizon 2020), to cover other cost items (such as research costs, travel, family and mobility allowances, and indirect costs) may be paid to the researchers in order to complement this contribution. In addition to the living allowance, the beneficiary must pay a mobility allowance and for some categories of researchers, a family allowance. for researchers recruited under a fixed-amount fellowship: not lower than EUR 1298.50 (for early-stage researchers) and EUR 1 837.50 (for experienced researchers). "MSCA-Cofund Programme. Opening up new horizons for researchers. 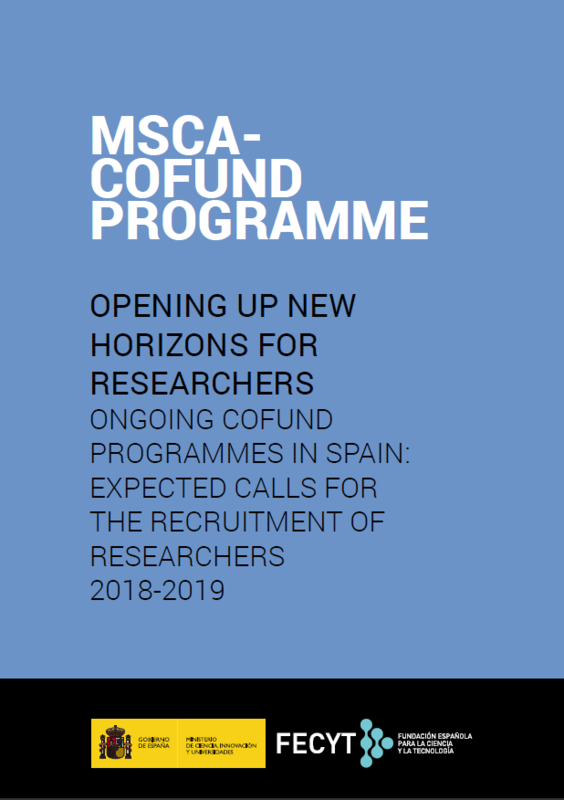 Ongoing COFUND programmes in Spain 2018-2019"
This document compiles information relative to those ongoing MSCA-COFUND PROGRAMMES in Spain:expected calls for the recruitment of researchers in 2018 and 2019 for the recruitment of researchers. "MSCA-Cofund Programme. Opening up new horizons for researchers. 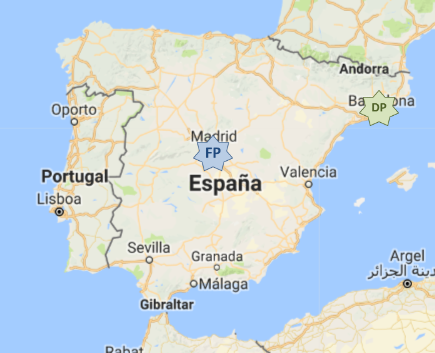 Ongoing COFUND programmes in Spain 2017-2018"
This document compiles information relative to those ongoing MSCA-COFUND PROGRAMMES in Spain with foreseen open calls in 2017 and 2018 for the recruitment of researchers.